The Sweetwater girls are Colorado natives, and fabric designers whose fabrics I love. I started the June Jelly Roll Party sample on Friday. And all the blocks are made and on the design wall today! The pattern is "Celebrate," and the fabric is "Wishes" by Sweetwater for Moda. Yes, I'm using the same fabric as used on the pattern cover. Do you often do that, or do you always choose your own fabrics? Okay I've got the pattern (I LOVE PDF patterns!) and I've certainly got enough jelly rolls. But I'm waiting till June. This looks like fun! 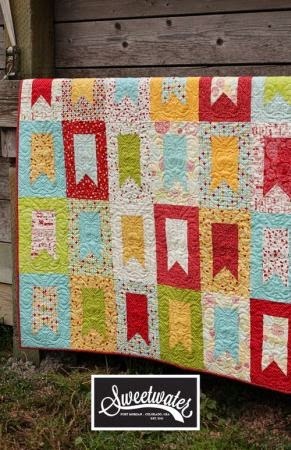 Cute little flag blocks - I would hardly ever make something just like the original - I'm a bit of a rebel. That is a great design. 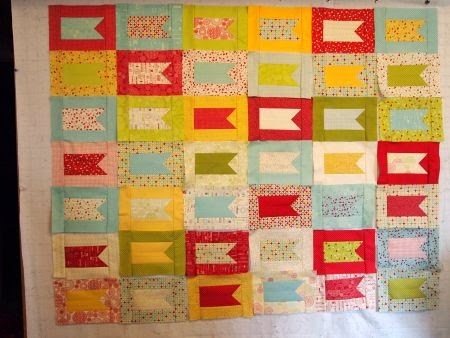 I will sometimes use the same fabrics if I really like the looks of the quilt. Joy, I so understand. I always feel bad when I make a shop sample, and by the time the class rolls around, the fabric is sold out! I used that great binding tutorial again (Susies magic binding) on a quilt, and have shared your tutorial link both in my blog post and on several Facebook quilt pages. I love the way it adds such a cool finish to a quilt. My new sewing machine has a "ditch quilting foot" for the walking foot and the blade rode right between the 2 colors and I had beautiful straight stitching on the flange. I am just thrilled to share your tutorial link. :) Now that this project is nearly finished, I might get to play with some new blocks soon. Mary, I'm so pleased that Susie's Magic Binding works for you. Sorry I had to answer here in the comments, I couldn't find an email address for you anywhere!